AeroLap v5 is a major upgrade to v4 with a number of new modelling, solver and user interface features and bug fixes. Road wheel angle is now a 2D function of strut length and rack travel, improving modelling accuracy. Previously it was a function of hand wheel angle only. 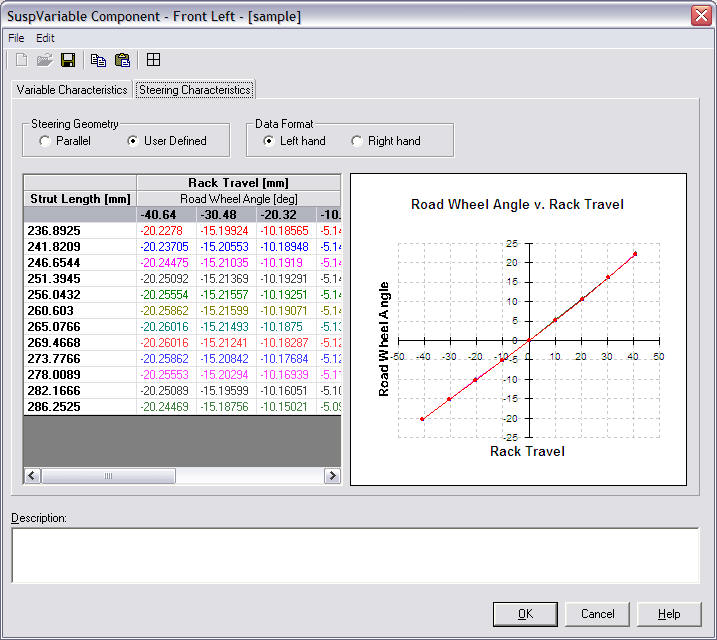 Rack travel is now output as a separate channel, with a new Rack Ratio property defining the relationship between Hand wheel and road wheel steer angles. The new format of steering data can be directly calculated for you from a set of 3D suspension points by AeroSusp, and exported to AeroLap. All suspension geometric properties are now 2D functions of strut length and rack travel. Previously they were functions of strut length only. Hub position is added as an input property table, in addition to the previously existing velocity ratio. 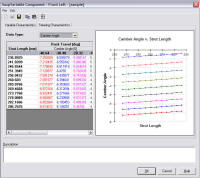 This improves integration accuracy for force/displacement characteristic calculation. The physical stiffness of the suspension links and mounting points are modelled as an additional compliance between the tyre and the suspension spring. This allows more accurate ride height modelling. Toe and camber compliance are each modelled for front and rear suspensions with 4 gain coefficients, capturing force and moment based compliance. New compliant toe and compliant camber channels added. RPM and throttle dependent Brake Specific Fuel Consumption map added to Engine module. Fuel_consumed and fuel consumption rate channels added. 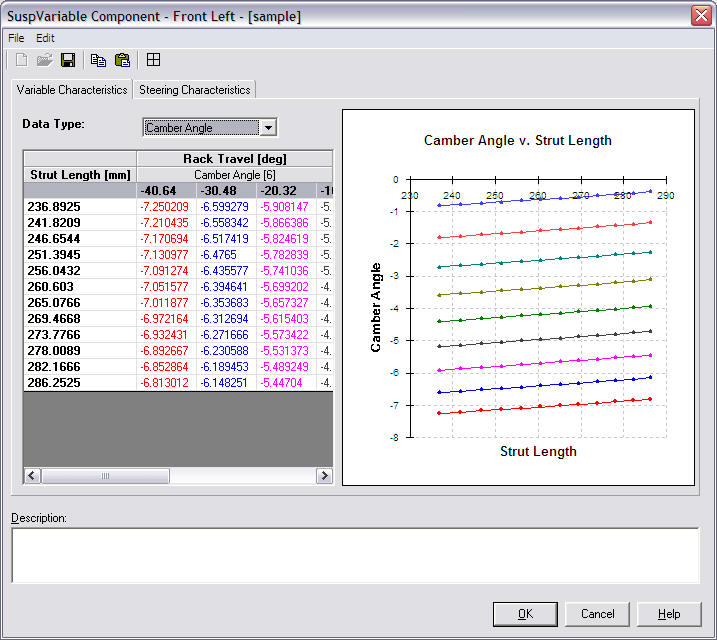 Tyre components now include an aligning torque model where SAT is a function of camber, vertical load and slip angle. 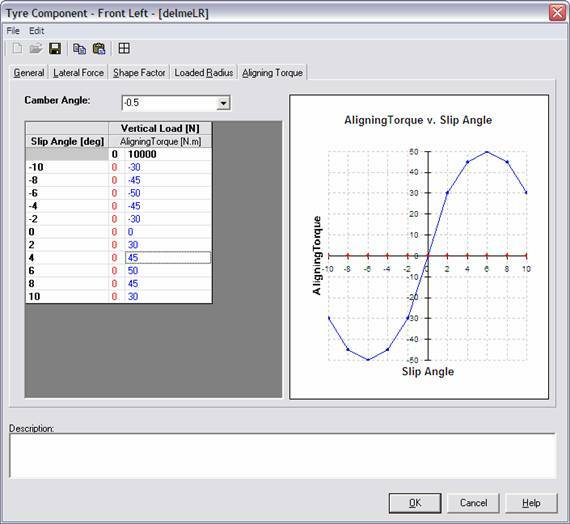 Torque around the steering axis due to tyre longitudinal and lateral forces, caster and kingpin offset, and tyre aligning torque is now calculated. The torque reaction at the hand wheel is found using the hand wheel to rack motion ratio, and the instantaneous rack to road wheel motion ratio. New hand wheel torque channel added. The rolling radius of the tyre, which defines the distance covered in one revolution, can now be either fixed or a variable function of speed, vertical load and camber. The main chassis force/displacement solver now has adaptive behaviour which copes better with suspensions that have very stiff centre spring arrangements. Solution are up to 30% faster, and ride heights are more accurate under some conditions. Aerodynamic offsets (lift, drag, balance) can be defined as a property of track position. This allows active aerodynamic strategies (front or rear wings) to be modelled using standard quasi-static techniques. Gear change time can now be set on an individual change gear basis. v4 added the History feature, which saves all run in memory, allowing you to restore an event with its results data with a single mouse click. v5 adds the ability to save the history to disk, so it can be reloaded with the base event. 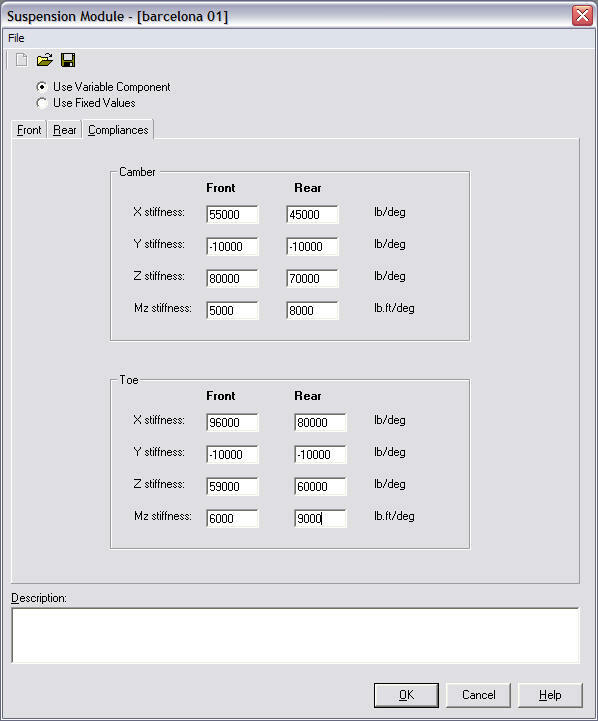 A new type of component, the Suspension Inventory, has been added. This allows you to define a set of suspension springs and anti-roll bars by name, making it easy to pick out items from those you know you have in stock. Another new type of component, the Aero Trim Grid, has been added. 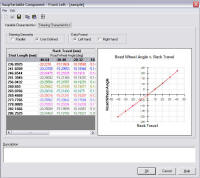 This allows you to define a set of aerodynamic trim items (which add an offset to the base aeromap) in a grid format. This is particularly useful to categorise the available front and rear wing combinations with front wing angles and rear wing hole positions. A Licence Manager has been added to allow easier diagnostics of licensing problems, and a clear user interface to manage multiple licences. This is particularly useful when managing licences with different permissions, such as Network and Local licences.